I’m not a hoarder by any stretch of the imagination, but I have a hard time letting go of items I’m positive I can use someday. And every time I did deep into a pile of long-forgotten gems, I am always so pleased that I didn’t do away with them. My best friend knows I love mirrors and thrift store finds, so several years ago at Christmas she gave me two beautiful wooden mirrors in major need of some TLC. I have saved these mirrors for easily three years, if not longer. 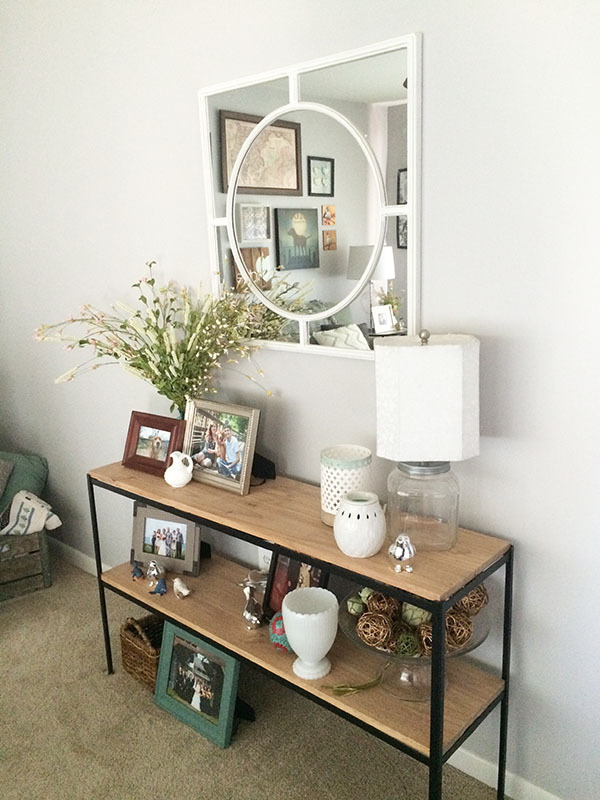 If you are a regular reader of my blog, you’ve seen my console table in my family room that is just begging for a mirror above it. It sits directly across from our bay window, and a mirror would brighten up the space so wonderfully. 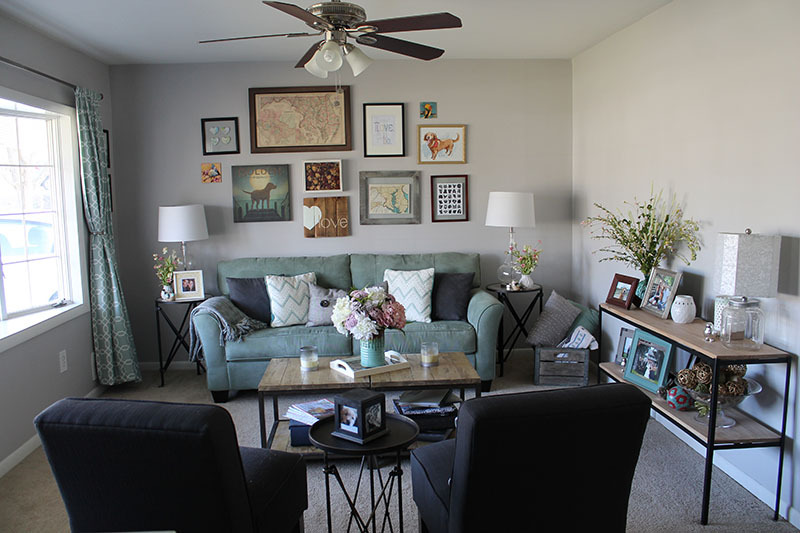 I’ve been searching high and low for a mirror to hang above the console table, checking HomeGoods, Target, Craigslist, thrift stores… the usual spots for inexpensive decor. I was in no rush, so I chose to be super picky (I didn’t want a square mirror and was hoping to find a mirror with a unique, not trendy shape). 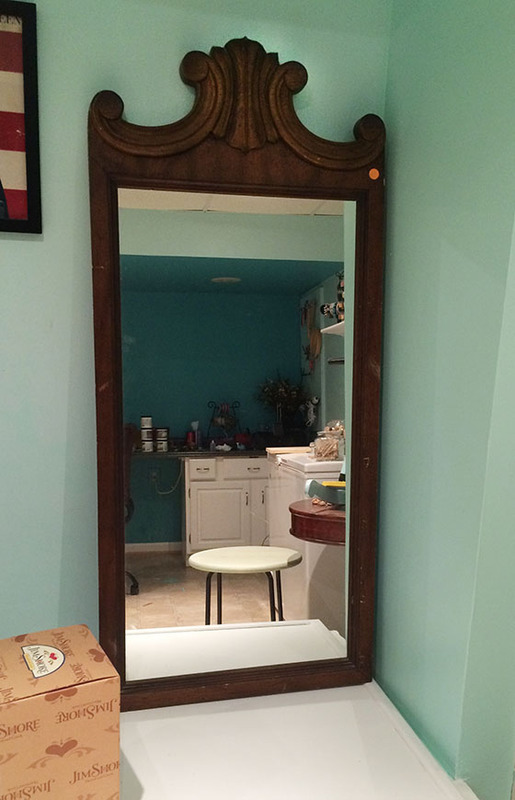 I’d found a mirror I loved on Craigslist, but it was too pricey. By the time I decided I should just go for it, it was sold. It just wasn’t meant to be. I was avoiding the pair of mirrors from Dana for many reasons. First of all, they are tall and skinny, and the orientation cannot be changed because of the fancy detail at the top. Plus, I only needed one mirror and didn’t want to split up the pair. And lastly, they were just fancier than I wanted. I don’t think of my house as fancy and really love the relaxed vibe the whole house has, so I didn’t want to throw this traditional mirror in the mix and have it look strange. I leaned one up against the wall as a test many times and wasn’t crazy about the look, but I bit the bullet and decided to go for an update to the mirrors because they needed it anyway. Who cared if one sat upstairs for a while as the other pined away for its mate in the basement. They are just mirrors, after all. I sanded down the frame and taped off the edges of the mirrors, then proceeded to paint the whole thing white. I only have transformed one of the mirrors because I wanted to make sure I liked it. Turns out, I do. 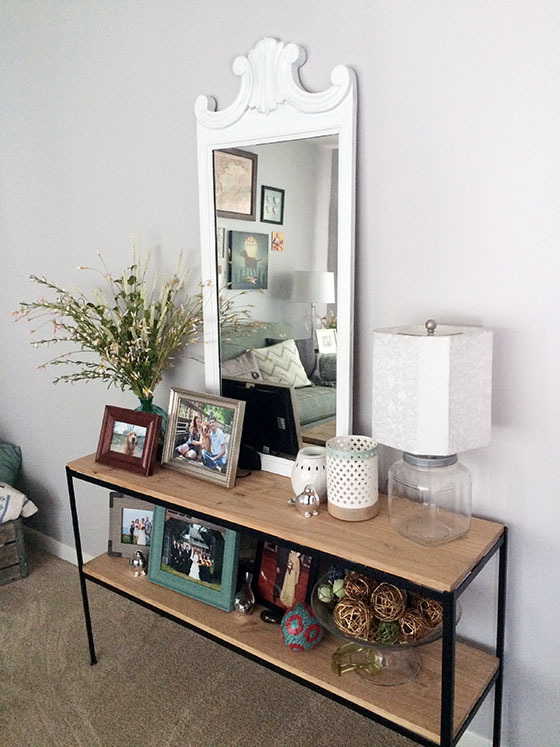 And these fancy mirrors don’t look half bad on my console table! I titled this post “A temporarily permanent mirror” because I plan on continuing my hunt for a different mirror, either new or used. Regardless of my hunt, I’m so pleased that I like this mirror in my house and over the table — I truly didn’t think I would, but it’s growing on me. I still think it doesn’t have the right proportions for the space, though. Plus, it kills me to separate the pair of mirrors. Now I just need to paint the second mirror white and find a place for the pair. I have a couple of ideas where they might look nice. These mirrors are super heavy, so if I do choose to leave it, I’ll need to get heavy-duty hanging materials for the wall. I like it leaning, but I think for safety reasons I’d rather it be mounted instead. I’d hate for Remmy to bump the table and for this to fall and hurt him. Anywho, don’t you just love when someone that’s been sitting in your basement for years turns out to be just what you were looking for, even temporarily? I know I do!